Thank you to Cat from My Lip Addiction for tagging me to do this special post. Since I love beauty products, especially lipsticks, it was fun to answer these questions and create some new art for this post. Here are the Rules: 1. Tag 3 bloggers to answer the same questions. / 2. Those 3 bloggers will tag 3 more bloggers with the same questions and rules. / 3. No tagging back (mentions are fine). 1. How many lipsticks do you own? If I count those that are lost in different bags, probably around 10. 2. What was your first ever lipstick? I don’t know… I was more into lip gloss than lipstick in my teenage years until my mid twenties. It completely changed a few months ago. I wanted a more mature look for my real first job and also I stopped dramatic eye makeup looks… I’ve also become more lazy to be honest! So… less eye makeup = more color on the lips! 3. What is your most worn lipstick? This one currently. It is very cheap but the color and texture are just perfect (Kiko, number 915). It is actually darker than it looks in the picture. 4. What is your favourite brand for lipsticks? I would definitely say Kiko because I’m not gonna lie, it’s cheap and very good!! And no weird flavor. And also you can basically find ANY color you want. Even blue. 5. What is your favourite finish? Sorry guys, I’ll pass on that question. 6. What is the last lipstick you bought? This amazing Kiko lipstick. I already had one but lost it in my car and found it again. And recently lost it again. Welcome to my world. 7. How many lip products do you currently have in your bag? 2. 8. What lipstick do you use to rock a red lip? 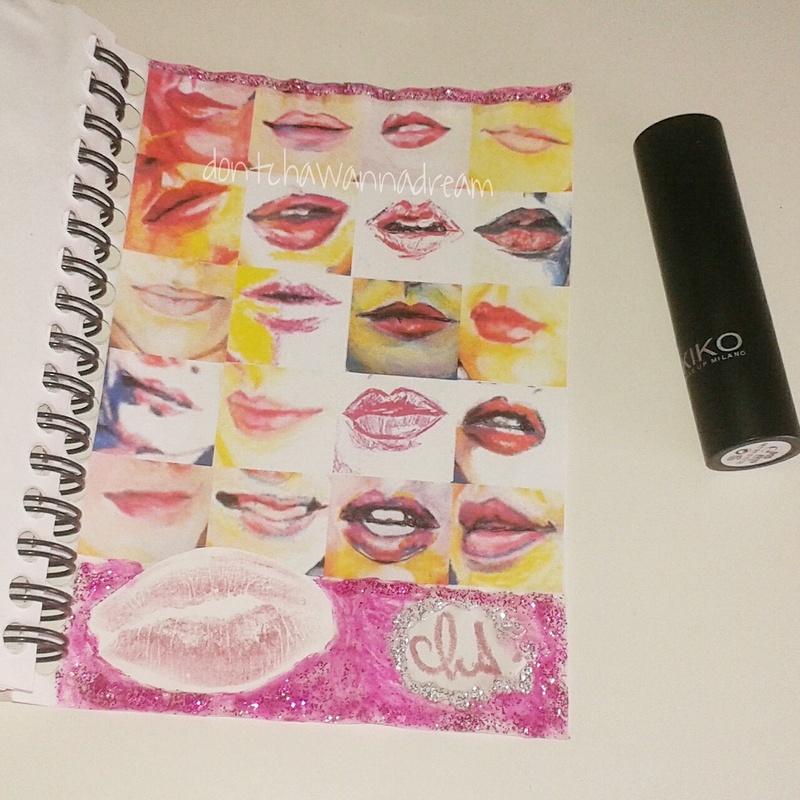 One Kiko lipstick. The best red I’ve ever tried. It’s a dark red. Number 909. Love it. Perfect if you don’t have the time to do your eye makeup. 9. How do you store your lipsticks? Ahahah Come on, what is that question? Read my answers, you know I lose everything! I don’t store. I am the worst. 10. What lip products are you currently lusting over? Lipcare products for the summer! I will probably buy one lip balm by The Body Shop. Love their products. I’m not sure my nominees will answer these questions but a little bit of promotion is always good, isn’t it? My blog is not about beauty products but I really had a lot of fun to create this lip art with some of my paintings and drawings. So thanks Cat for giving me the opportunity to be creative! Thanks so much! 😉 🙂 I just had this idea when I woke up. I just wrote you !!!!!!!!!!!!!!!! incredible ……. and tweeted u lol – SO VERY BEAUTIFUL – Your Aquarian ideas – Hello – GENIAL !!!!!!!!! No problem! My pleasure, Cam! My pleasure, Mary!! 🙂 Thank you! But Cha, here is what I forgot to say. Wow, great work on all the different forms and shapes of the lips, and the color selections are fantastic! Lips are not easy to draw and make look realistic – yours has all the characteristics. ohhh thanks so much, Mary! Coming from you, it means a lot. Your technique is soooo impressive. Thanks for the support. Now if this was about chocolate. . .